Ben Stevens, the former Republican Alaska Senate president who federal authorities investigated for political corruption, says he's thinking about running for governor in next year's election. "I've lived through a few storms in my life, and I think I know what it takes to survive and I know what it takes to move into the future," Stevens said in a phone interview Thursday. "Alaska's facing some difficult times, and we're just contemplating whether we can make a contribution or not in a public position," he said. "When we make a decision, people will know." 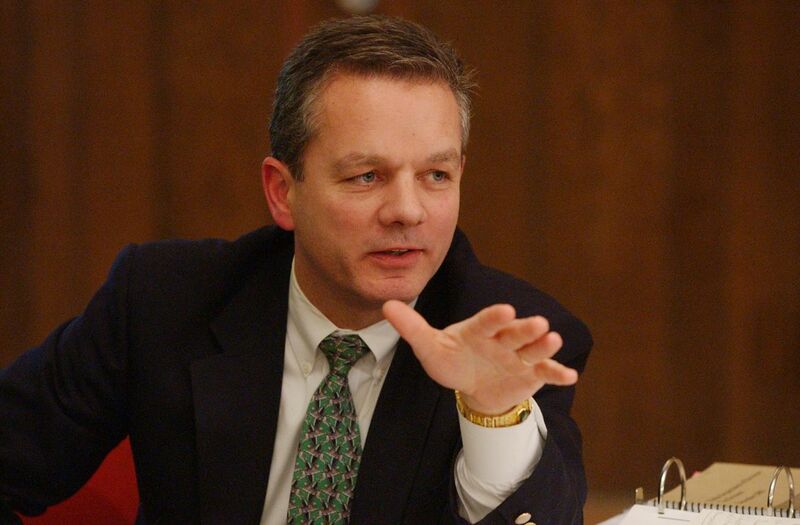 Stevens, son of late U.S. Sen. Ted Stevens, R-Alaska, said he attended a Nashville, Tennessee, conference for candidates last week hosted by the Republican Governors Association, a political group that supports GOP hopefuls. His wife, Elizabeth, went with him on what Stevens called an "exploratory mission." Stevens, 58, was appointed to a vacant Anchorage state Senate seat by Gov. Tony Knowles in 2001. He ran unopposed the following year and was elected Senate president by his colleagues in 2005, but didn't seek re-election when his four-year term ended in 2006 as he became mired in a federal corruption investigation. 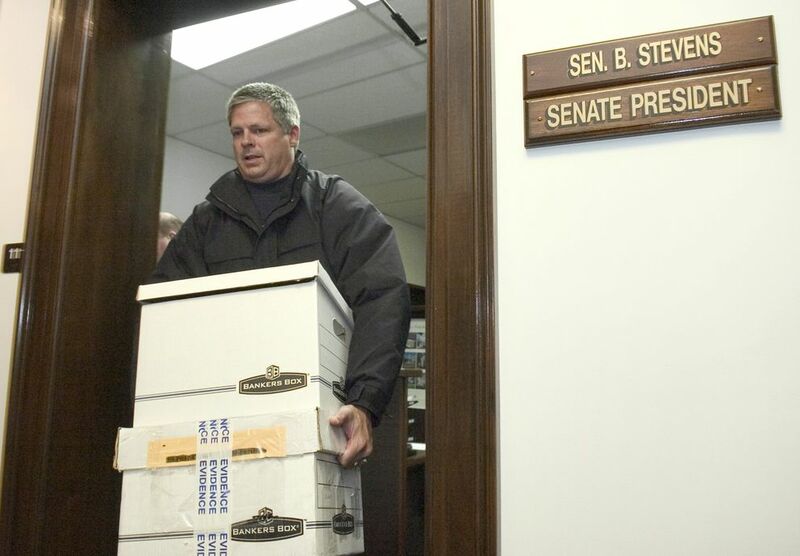 On Aug. 31, 2006, the FBI raided Stevens' state offices in Juneau and Anchorage, along with the offices of at least five other legislators, in connection with the federal investigation into Alaska political corruption. Ben Stevens was never charged with a crime. But executives of Veco Corp., the politically active oil field services company at the center of the investigation, testified in subsequent corruption trials that they paid Stevens more than $240,000 for "consulting" work while he served in the Senate, according to disclosures Stevens filed. He never explained what he did to earn the money, and a Veco vice president testified in the 2007 trial of another legislator that the company had bribed Stevens and another state senator, John Cowdery. While Stevens wasn't charged, the federal investigation, and other accusations of political corruption, left a "series of unanswered questions that would trouble voters," said Jerry McBeath, emeritus political science professor at University of Alaska Fairbanks. The connection to his father should help, McBeath added, but Stevens "would be campaigning under somewhat of an ethical cloud." On the other hand, McBeath said, "we're in a new era, when President Trump has popularized the idea of 'fake news.' "
"Maybe in this new political environment, some of the charges that were made against Ben Stevens will be considered inconsequential," he said. Stevens wouldn't commit to answering questions about the investigation if he decides to run for governor, even though the statute of limitations has run out for federal bribery and fraud charges. "I think the outcome of the federal investigation pretty much answers any questions," he said. "The outcome is the answer." Since leaving the Legislature, Stevens said, he's been working and raising his four children. He's now president of Cook Inlet Tug and Barge — the company's toll-free number redirects to his cellphone, though state corporation records show it's a unit of tug company Foss Maritime. Cook Inlet Tug and Barge operates from the Aleutians to Southeast Alaska. One state Republican Party official, vice chairman Rick Whitbeck, said Stevens would be welcome in what's expected to be a crowded GOP primary. The time that's passed since Stevens was in the state Senate, Whitbeck said, gives him an opportunity to reintroduce himself to Alaskans. With newer voters, Whitbeck said, Stevens "has a chance to write the story from scratch." As for others, Whitbeck added: "People have long memories. But the Alaskan way is to be quick to forgive and quick to forget, for the most part."